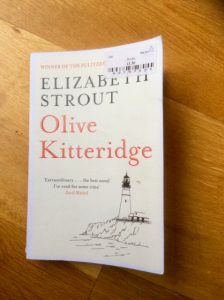 This entry was posted in American Literature and tagged Elizabeth Strout, Olive Kitteridge by Simon Lavery. Bookmark the permalink. I remember the heading quote from the series, which I loved. I have the book which I hope to get to next year. Happy Xmas to you and yours. I meant to mention the HBO miniseries and forgot! I haven’t seen it. Thanks for the Christmas wishes, and the same to you – and have a great 2018. Wonderful piece, Simon. I loved Olive Kitteridge, such wonderful insight by the author into the psychology of her characters. Have only read this and My Name is Lucy Barton by her, really must read more soon. Thanks, Ali. I picked up a copy of L Barton in another charity shop recently, so hope to read it soon. Greetings of the season, enjoy the break! Thanks for this enticing vignette Simon. I really enjoyed the miniseries — I think it was revised a bit but Olive was played by the aways wonderful Frances McDormand! Richard Jenkins (equally great) plays Henry. If you care to, would love to see you return to this work. Each story is a fascinating gem in its own right, and they combine to create something even more powerful.